The Winchester & District Badminton Association website is powered by EasierThan Website Design who are continually striving to make the websites they produce more inclusive and accessible to all users regardless of technological or physical disability. If you experience problems using these tools on the Winchester & District Badminton Association website or have any recommendations to improve accessibility using assistive technology please contact EasierThan Website Design via their website and we'll do our best to make improvements. 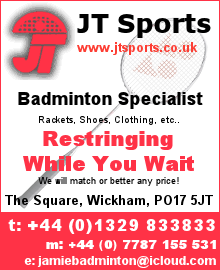 The Winchester & District Badminton Association website (powered by EasierThan Website Design) has been designed in accordance with the World Wide Web Consortium's (W3C) internationally recognised Web Accessibility Initiative (WAI) guidelines. The WAI is a set of guidelines for producing usable and accessible websites.